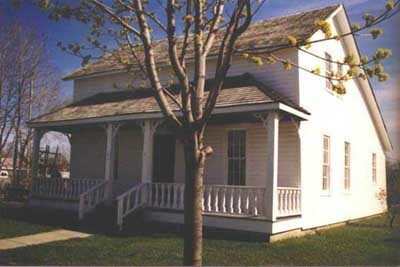 The Selinsky-Green Farmhouse Museum, which is located behind the St. Clair Shores Public Library, represents the history of a family that was typical of the late nineteenth century settlers in this area. John and Mary Selinsky, Polish immigrants, came to Erin Township (now St. Clair Shores) in 1868, bought property and built their salt-box structure of log timber framework. They sold it to their daughter Ernestine when she married German immigrant John Green in 1874. Green descendants lived in the house until 1974 when the State Highway Commission bought the house and land to make way for the I-696/I-94 interchange. The Museum was moved to its present location and is owned by the City of St. Clair Shores under the direction of its Historical Commission. It is listed in the Michigan state register of historic sites. The Farmhouse has been meticulously restored over the past years by our dedicated volunteers. Thanks to them, this piece of St. Clair Shores history has been preserved and restored for our future generations to enjoy.